It is an undeniable fact and a pressing reality that engineers are in high demand in Australia. The job market of Australia has witnessed a surge in engineering and construction occupations and therefore, the demand for engineers has skyrocketed in the last couple of years. This includes all major engineering occupations including mechanical, electrical, electronics and civil engineers. According to a recent survey of the job market, more than half of the engineers employed in the Australia, including governmental employees and those hired by private companies, are immigrants. Either they have arrived in Australia on one of the skilled visa immigration schemes or they are the Australian graduates who received their qualifications from an Australian institute. Australia relies heavily on offshore candidates to tackle the rising demand of their engineering industry that has been valued at $1000 billion. Despite having a high number of engineers in the job market already, researchers and government officials have warned that in the recent years, there could be an acute shortage of engineering/construction/technical work professionals in the job market. Pertaining to this, the government is now actively looking to increase the yearly intake of such professionals. Here we would like to quote some figures from the engineering body in Australia responsible for assessing the industry trends, Engineers Australia. In light of research carried out, only 6 percent of Australian girls and 11.5 percent of boys are studying advanced levels of engineering courses in various institutes. This is just a meagre situation keeping in mind the burgeoning trends of demand of engineers. It should also be noted that among the engineering professionals entering the Australian job market, 9850 were entry level professionals/graduates, while 16000 were immigrants on who were on their temporary and or permanent visas. The government now is faced with acute issue of how to tackle the demand and supply gap of skilled workers and trades men. Some governmental officials have called for raising the cap of such professionals while others have argued against this option. Whatever the future pathway of the government is, the ultimate answer to this critical issue is to either increase the current intake of international graduates and students who are looking forward to study engineering in Australia or raise the cap for skilled professionals from other countries who may enter Australia on various work visas. In order to further gain assistance regarding how you can boost up your overall score and if you want free one-on-one consultations, Vision Consultants Australia (education agent, migration agent) can provide expert education and migration consultancy and visa services. Unparalleled service standards have given us an industry feat of best education agent and migration agent in Australia. Our team of MARA registered agents is always there to guide you. Planning to Apply for Temporary Graduate Visa (sub-class 485) – Here’s what you need to know! 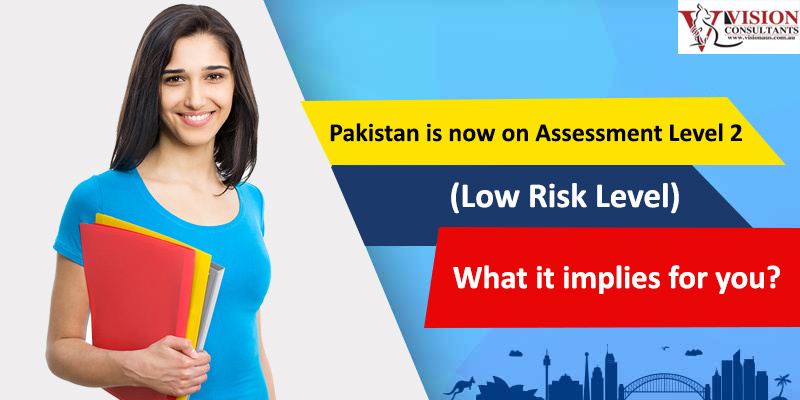 Pakistan is now on Assessment Level 2 (Low Risk Level) – What it implies for you?